Malham is a small very attractive village in the Pennines at the southern part of the Yorkshire Dales. Malham beck flows through the centre and the village is surrounded by limestone dry-stone walls and limestone pavements. In the early 1900’s Malham was an industrial village of mills and mines but now it is hill farming and tourism. 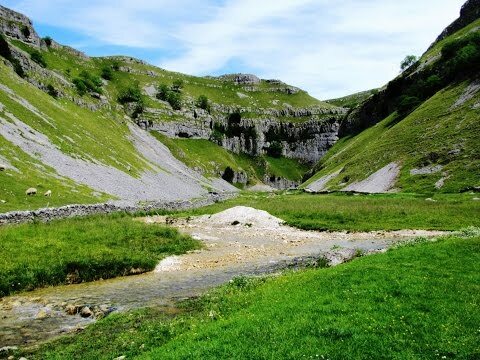 Malham is a very popular destination for holiday makers, day trippers and walkers with the long distance path the Pennine way passing through the village and with the main tourist attractions being Malham Cove, Malham Tarn, Janet’s Foss and Gordale Scar. The village also has a National Park Information Centre. The yearly agricultural and horticultural show known as the Malham Show is held on the Saturday before the August Bank Holiday and holds many competitions from Lego models to fell running. Another major annual event is the Malham Safari, where all the villagers build sculptures around the village and put up stalls on the green. Malham houses two pubs The Buck Inn and The Lister Arms both with accommodation, a small shop, a post office, the Beck Hall B&B and tea room and a youth hostel. Janet’s Foss is a small waterfall fed from Gordale Beck falling over a moss covered tufa screen limestone out crop and dropping into a deep pool below. Foss is an Old Norse word for waterfall or force and Janet (or Jennet) was believed to be the queen of the local fairies who lived in the cave behind the fall. The cave across the stream known as Janet’s cave, it is said she did not live there, was inhabited by smelters working the copper mines at Pikedaw to the west. The pool below the fall was once used to wash sheep which encouraged new wool growth, lifting the fleece from the skin, after the shearing of the sheep. Gordale Scar is a dramatic limestone ravine carved by the water from melting glaciers. The overhanging limestone cliffs over 100 metres high contains two waterfalls. The stream flows through the gorge then over Janet’s Foss before joining Malham Beck two miles downstream to form the River Aire. The right of way leads through the gorge over the waterfall, where a climb is required, to the limestone plateau at the top. Malham Tarn is a glacial lake 377 metres or 1,237 ft above sea level making it the highest lake in England and is a nature reserve owned by the National Trust. The stream from Malham Tarn disappears underground through sink holes in the limestone and reappears at Airehead Springs. This pretty lake is home six species of fish, wildlife, wildfowl, waders and many species of flora and fauna. Malham Cove is a natural limestone formation standing at 80 metres high. It is a curved limestone cliff at the head of the valley with a limestone pavement at the top. This well known beauty spot is where the Peregrine Falcons nest amongst the crevices. The viewpoint is next to the public footpath below the cliffs at the bottom of the cove and is under a mile through the village from the visitors centre. The view point is wheelchair accessible. This year of 2011 the Peregrine Falcons have hatched three chicks, one female and two males, which fledged on the 13th and 14th of June. We park in Malham village near the Lister Arms and walk over the bridge. We then turn left past the Buck Inn and take the footpath on the left next to the smithy. We cross a small bridge and turn right. We follow the footpath (track) and go through a gate and then after a short way we turn left and head forward. We enter the wood and follow the path to Janet’s Foss. We then keep following the path until we reach a road here we turn right. We follow the road round to the left then take the footpath on the left, through a camping area, to Gordale Scar. We scramble up the waterfall at Gordale Scar, which can be difficult and dangerous in wet weather, and keep heading up the steep gorge until we reach the top. At the top we follow the path then go over a stile and walk across the open grassy ground with some limestone pavements, it is quite level now, until we reach the corner at the wall with a stile and a car parking area. We go over the stile and walk on the track to the sign post in front of us and a post with “no cars” here we turn right and follow the track towards the tree line. We go through a gate just before reaching Malham Tarn and walk to where the lake meets the path. After a break we walk back through the gate we came through and turn right following the Pennine Way to a car park. At the car park we turn right onto the road and after a short way turn left through a gate and keep following the Pennine Way to the left. We keep following the path with the wall on our left then through the cut in the hillsides and follow the path round until we come to a steep valley on the left here we head down the valley. At the bottom we follow the path until we reach a ladder stile over a wall on our left, the limestone pavement on our right and a view down into Malham Cove in front of us. We turn right across the limestone pavement then through a gate and head downhill on some steps to Malham Cove. At the bottom we follow the path through the fields to the road where we turn left back into the village of Malham. A moderate to hard walk with some very steep inclines and declines at Gordale Scar and down into Malham Cove. There is car parking area at Street Gate where wheelchairs can access part of Malham Tarn. Approx 7.5 miles using OS map OL2. Malham is between Skipton and Settle in the Yorkshire Dales. From Skipton take the A65 towards Settle. Pass through Gargrave then after going over the River Aire turn right at Coniston Cold. Follow the road through Airton and Kirkby Malham to Malham. In Malham there are public toilets in the National Park Visitors Centre car park and for refreshments there are two pubs, a cafe, tea rooms, a small shop and a post office.